Data from atlases have been used in a wealth of scientific studies, from helping to design future surveys, examining predictors of bird distributions, to testing theoretical questions. Below is a list of scientific publications that have utilised data from one or more of the last three bird distribution atlases. If you know of any other publications not included on this list please contact the BTO using the email address at the bottom of the page. Araújo, M.B., Williams, P.H. & Fuller, R.J. (2002) Dynamics of extinction and the selection of nature reserves. Proceedings of the Royal Society Lond. B, 269, 1971-1980. Araújo, M.B., Thuiller, W., Williams, P.H. & Reginster, I. (2005) Downscaling European species atlas distributions to a finer resolution: implications for conservation planning. Global Ecology and Biogeography, 14, 17-30. Atkinson, P.W., Fuller, R.J. & Vickery, J.A. (2002) Large-scale patterns of summer and winter bird distribution in relation to farmland type in England and Wales. Ecography, 25, 466-480. Atkinson, P.W. & Robinson, R.A. (2002) Landscape diversity and bird populations: the need for regionally flexible and scale-dependent agri-environment schemes. In: Avian Landscape Ecology. Pure and applied issues in the large-scale ecology of birds (eds D. Chamberlain & A. Wilson) pp 289-299. Proceedings of the 2002 Annual IALE Conference. Bell, J.C., Burton, N.H.K., Walls, R., Musgrove, A.J., Allan, J.R., Rehfisch, M.M. & Watola, G. (2003) Study on the potential safety risks from birds at and around a potential new airport at Cliffe Marshes and measures for mitigating those risks. Report by the Birdstrike Avoidance Team, Central Science Laboratory and British Trust for Ornithology to the Department for Transport. Department for Transport, London. Bellamy, P.E., Brown, N.J., Enoksson, B., Firbank, L.G., Fuller, R.J., Hinsley, S.A., Schotman, A.G.M. & Swetnam, R.D. (1998) The influences of habitat, landscape structure and climate on local distribution patterns of the nuthatch (Sitta europaea L.) . Oecologia, 115, 127-136. Bircham, P.M.M. & Jordan, W.J. (1996) A consideration of some of the changes in distribution of "common birds" as revealed by the New Atlas of Breeding Birds in Britain and Ireland . Ibis, 139, 177-179. Blackburn, T.M., Gaston, K.J., Greenwood, J.J.D. & Gregory, R.D. (1998) The anatomy of the interspecific abundance-range size relationship for the British avifauna: II. Temporal dynamics. Ecology Letters, 1, 47-55. Blackburn, T.M., Gates, S., Lawton, J.H. & Greenwood, J.J.D. (1994) Relations between body size, abundance and taxonomy of birds wintering in Britain and Ireland. Phil. Trans. R. Soc. Lond. B, 343, 135-144. 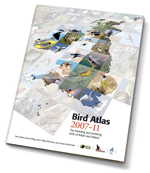 Brown, A.F., Stillman, R.A. & Gibbons, D.W. (1995) Use of breeding bird atlas data to identify important bird areas: a northern England case study. Bird Study, 42, 132.143. Carey, P.D., Preston, C.D., Hill, M.O., Usher, M.B. & Wright, S.M. (1995) An environmentally defined biogeographical zonation of Scotland designed to reflect species distributions. Journal of Ecology, 83, 833-845. Chamberlain, D.E. & Fuller, R.J. (2000) Local extinctions and changes in species richness of lowland farmland birds in England and Wales in relation to recent changes in agricultural land-use. Agriculture, Ecosystems and Environment, 78, 1-17. Chamberlain, D.E. & Fuller, R.J. (2001) Contrasting patterns of change in the distribution and abundance of farmland birds in relation to farming system in lowland Britain. Global Ecology and Biogeography, 10, 399-410. Chamberlain, D.E., Fuller, R.J., Shrubb, M., Bunce, R.G.H., Duckworth, J.C., Garthwaite, D.G., Impey, A.J. & Hart, A.D.M. (1999) The Effects of Agricultural Management on Farmland Birds. BTO Research Report 209. British Trust for Ornithology, Thetford. Chamberlain, D.E., Warren, R.W., Crick, H.Q.P., Hall, J., Metcalfe, S., Ormerod, S., Whyatt, D. & Vickery, J.A. (2000) Acidification and Terrestrial Birds . BTO Research Report 236. British Trust for Ornithology, Thetford. Donald, P.F. & Fuller, R.J. (1998) Ornithological atlas data: a review of uses and limitations. Bird Study, 45, 129-145. Donald, P.F., & Greenwood, J.J.D. (2001) Spatial patterns of range contraction in British breeding birds. Ibis, 143, 593-601. Evans, K.L., Greenwood, J.J.D. & Gaston, K.J. (2005) The roles of extinction and colonization in generating species-energy relationships. Journal of Animal Ecology, 74, 498-507. Evans, K.L., Greenwood, J.J.D. & Gaston, K.J. (2005) Relative contribution of abundant and rare species to species-energy relationships. Biology Letters, 1, 87-90. Evans, K.L., Warren, P.H. & Gaston, K.J. (2005) Does energy availability influence classical patterns of spatial variation in exotic species richness? Global Ecology and Biogeography, 14, 57-65. Foody, G.M. (2005). Mapping the richness and composition of British breeding birds from coarse spatial resolution satellite sensor imagery. International Journal of Remote Sensing, 26 (18), 3943-3956. French, D.D. & Picozzi, N. (2002) 'Functional groups' of bird species, biodiversity and landscapes in Scotland. Journal of Biogeography, 29, 231-259. Fuller, R.J., Gregory, R.D., Gibbons, D.W., Marchant, J.H., Wilson, J.D., Baillie, S.R. & Carter, N. (1995) Population declines and range contractions among lowland farmland birds in Britain. Conservation Biology, 9, 1425-1441. Fuller, R.J., Henderson, A.C.B. & Wilson, A.M. (1999) The Nightingale in England - problems and prospects. British Wildlife, 10, 221-230. Fuller, R.J., Hinsley, S.A. & Swetnam, R.D. (2004) The relevance of non-farmland habitats, uncropped areas and habitat diversity to the conservation of farmland birds. Ibis, 146 (Suppl. 2), 22-31. Fuller, R.M., Devereux, B.J., Gillings, S., Amable, G.S., Hill, R.A. (2005) Indices of bird-habitat preference from field surveys of birds and remote sensing of land cover: a study of south-eastern England with wider implications for conservation and biodiversity assessment. Global Ecology and Biogeography, 14, 223-239. Gaston, K.J. & Blackburn, T.M. (2002) Colonisation, extinction and the range sizes of breeding birds in Britain. Journal of Animal Ecology, 71, 390-399. Gaston, K.J., Blackburn, T.M., Greenwood, J.J.D., Gregory, R.D., Quinn, R.M., & Lawton, J.H. (2000) Abundance-occupancy relationships. Journal of Applied Ecology, 37, 39-59. Gaston, K.J., Blackburn, T.M. & Gregory, R.D. (1997) Abundance-range size relationships of breeding and wintering birds in Britain: a comparative analysis. Ecography, 20, 569-579. Gaston, K.J., Blackburn, T.M. & Gregory, R.D. (1997) Interspecific abundance-range size relationships: range position and phylogeny. Ecography, 20, 390-399. Gaston, K.J., Blackburn, T.M., Gregory, R.D. & Greenwood, J.J.D. (1998) The anatomy of the interspecific abundance-range size relationship for the British avifauna: I. Spatial patterns. Ecology Letters, 1, 38-46. Gates, S. & Donald, P.F. (2000) Local extinction of British farmland birds and the prediction of further loss. Journal of Applied Ecology, 37, 806-820. Gates, S., Gibbons, D.W., Lack, P.C. & Fuller, R.J. (1994) Declining farmland bird species: modelling geographical patterns of abundance in Britain. In: Large-scale ecology and conservation biology (eds P.J. Edwards, R.M. May & N.R. Webb) pp 153-177. British Ecological Society 35th symposium. Blackwell, Oxford. Gibbons, D.W. (1993) The New Atlas of Breeding Birds in Britain and Ireland - an overview of results and methods. Br. Wildlife, 4, 360.366. Gibbons, D.W., Gates, S., Green, R.E., Fuller, R.J. & Fuller, R.M. (1995) Buzzards Buteo buteo and ravens Corvus corax in the uplands of Britain: limits to distribution and abundance. Ibis, 137 suppl., 75-84. Gillings, S. (2001) Factors affecting the distribution of Skylarks Alauda arvensis wintering in Britain and Ireland during the early 1980s. In: The ecology and conservation of skylarks Alauda arvensis (eds P.F. Donald & J.A. Vickery) pp 115-128. RSPB, Sandy. Gillings, S. (2003) Plugging the gaps - winter studies of Eurasian Golden Plovers and Northern Lapwings. Wader Study Group Bulletin, 100, 25-29. Gillings, S., Austin, G.E., Fuller, R.J. & Sutherland, W.J. (2006) Distribution shifts in wintering Golden Plovers Pluvialis apricaria and Lapwings Vanellus vanellus in Britain. Bird Study, 53: 274-284. Greenwood, J.J.D., Fuller, R.J. & Gibbons, D.W. (1997) Assessing changes in distribution from atlas data: reply to Bircham and Jordan. Ibis, 139, 186-189. Greenwood, J.J.D., Gregory, R.D., Harris, S., Morris, P. & Yalden, D.W. (1996) Relations between abundance, body size and species number in British birds and mammals. Phil. Trans. R. Soc. Lond. B., 351, 265-278. Gregory, R.D. (1995) Phylogeny and relations among abundance, geographical range and body size of British breeding birds. Phil. Trans. R. Soc. Lond . B., 349, 345-351. Gregory, R.D. & Blackburn, T.M. (1998) Macroecological patterns in British breeding birds: covariation of species' geographical range sizes at differing spatial scales. Ecography, 21, 527-534. Harrison, P.A., Vanhinsbergh, D.P., Fuller, R.J. & Berry, P.M. (2003) Modelling climate change impacts on the distribution of breeding birds in Britain and Ireland. Journal for Nature Conservation, 11, 31-42. Huby, M., Cinderby, S., Crowe, A.M., Gillings, S., McClean, C.J., Moran, D., Owen, A. & White, P.C.L. (2006) The association of natural, social and economic factors with bird species richness in rural England. Journal of Agricultural Economics , 57 (2), 295-312. Kirby, J.S. & Lack, P.C. (1993) Spatial dynamics of wintering Lapwings and Golden Plovers in Britain and Ireland, 1981/82 to 1983/84. Bird Study, 40, 38-50. Lennon, J.J., Greenwood, J.J.D. & Turner, J.R.G. (2000) Bird diversity and environmental gradients in Britain: a test of the species-energy hypothesis. Journal of Animal Ecology, 69, 581-598. Lennon, J.J., Koleff, P., Greenwood, J.J.D., & Gaston, K.J. (2001) The geographical structure of British bird distributions: diversity, spatial turnover and scale. Journal of Animal Ecology, 70, 966-979. Musgrove, A.J. (1997) Peregrines & Pigeons: investigations into a raptor-human conflict . PhD Thesis, University of Bristol. Prendergast, J.R. & Eversham, B.C. (1997) Species richness covariance in higher taxa: empirical tests of the biodiversity indicator concept. Ecography, 20, 210-216. Prendergast, J.R., Quinn, R.M., Lawton, J.H., Eversham, B.C. & Gibbons, D.W. (1993) Rare species, the coincidence of diversity hotspots and conservation strategies. Nature, 365, 335-337. Siriwardena, G.M., Baillie, S.R., Crick, H.Q.P. & Wilson, J.D. (2000) Agricultural land-use and the spatial distribution of granivorous farmland birds. Ecography, 23, 702-719. Stillman, R.A., & Brown, A.F. (1998) Pattern in the distribution of Britain's upland breeding birds. Journal of Biogeography, 25, 73-82. Thomas, C.D. & Lennon, J.L. (1999). Birds extend their ranges northwards. Nature, 399 (6733), 213. Thomas, J.A., Telfer, M.G., Roy, D.B., Preston, C.D., Greenwood, J.J.D., Asher J., Roy, R., Clarke, R.T. & Lawton, J.H. (2004) Comparative Losses of British Butterflies, Birds, and Plants and the Global Extinction Crisis. Science, 303, 1879-1881. Thompson, D.B.A., Gillings, S., Galbraith, C.A., Redpath, S.M. & Drewitt, J. (1997) The contribution of game management to biodiversity: a review of the importance of grouse moors for upland birds. In: Biodiversity in Scotland: status, trends and initiatives (eds L.V. Fleming, A.C. Newton, J.A. Vickery & M.B. Usher) pp 198-212. The Stationary Office Ltd, Edinburgh. Toms, M.P. (2001) Project Barn Owl: Evaluation of an Annual Monitoring Programme . BTO Research Report 177. British Trust for Ornithology, Thetford. Toms, M.P., Crick, H.Q.P., et al . (2000) Project Barn Owl: Final Report . BTO Research Report 197. British Trust for Ornithology, Thetford. Toms, M.P., Crick, H.Q.P., et al . (2001) The status of breeding Barn Owls Tyto alba in the United Kingdom 1995-97. Bird Study, 48(1), 23-37. Williams, P., Gibbons, D., Margules, C., Rebelo, A., Humphries, C. & Pressey, R. (1996) A comparison of richness hotspots, rarity hotspots and complementary areas for conserving diversity of British birds. Conservation Biology, 10, 155-174. Wilson, A.M., Henderson, A.C.B. & Fuller, R.J. (2002) Status of the Nightingale Luscinia megarhynchos in Britain at the end of the 20 th Century with particular reference to climate change. Bird Study, 49,193-204. Wotton, S.R. & Gillings, S. (2000) The status of breeding Woodlarks Lullula arborea in Britain in 1997. Bird Study, 47, 212-224.